GCaMP is a genetically encoded calcium indicator (GECI) and created from a fusion of green fluorescent protein (GFP), calmodulin (CaM), and M13, a peptide sequence from myosin light chain kinase. When GECI binds Ca2+, the conformational change of GCaMP induces proximity of the GFP parts, eliciting strong GFP fluorescence signal, which allows measuring action potentials and other receptor activation events that trigger Ca2+ influx. The advantage of GECI's are that they can be genetically specified for studies in living organisms. GCaMP6 is a novel ultra-sensitive format of GCaMP that outperformed other sensors in terms of accuracy and sensitivity in measuring cytosol Ca2+ level. Mutations in calmodulin part of GCaMP6 created several variants which showed different calcium fluorescence decay rate (fast - GCamP6f, slow - GCaMP6s and medium - GCaMP6m). 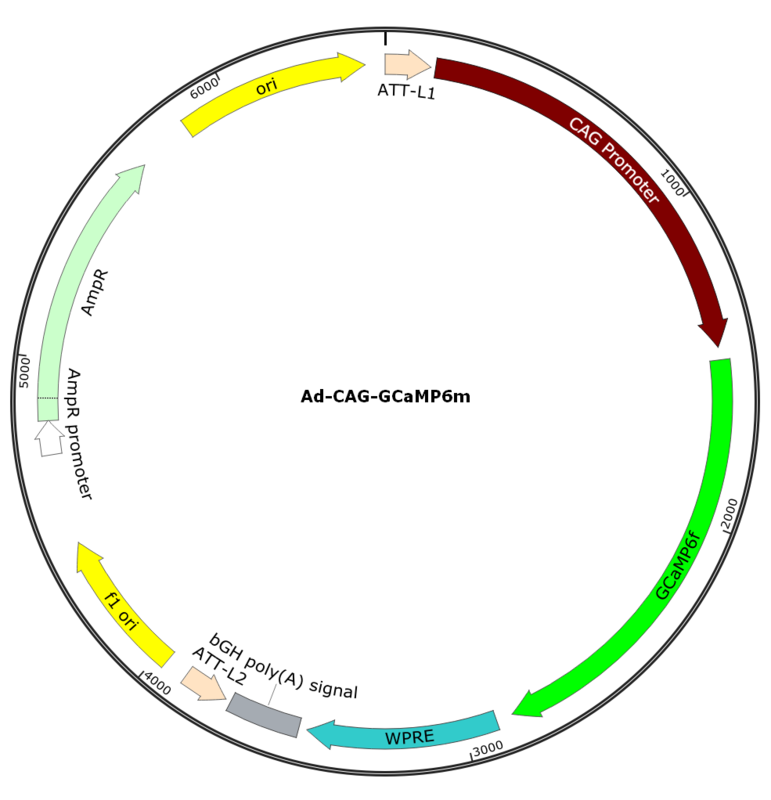 This recombinant human adenovirus type 5 expresses genetically encoded calcium indicator GCaMP6m under CAG promoter (also known as CBA promoter).